The S6 still impresses with its tonal voice, tough build quality and price tag. While we like the wider spread of the 45mm nut, electric players may prefer the smaller 43mm format of the S6 Cedar Original Slim. When Robert Godin launched Seagull guitars back in 1982, the brief was to offer some of the attributes of handmade acoustics for those unfortunate souls raiding piggy banks with the ribs showing. As you may already know, Godin is the brains behind guitar brands Art & Lutherie, Norman, Simon & Patrick, La Patrie, TRIC cases and, of course, Godin. Across those brands you’ll find plenty of innovation, not least in the shape of the Godin Multiac electro-acoustics and the LGXT MIDI controllers. Yet, of all of Godin’s products, possibly the most groundbreaking is the Seagull S6 acoustic. When the S6 began making its presence felt in UK music shops of the 1990s, affordable solid top acoustics were still thin on the ground. 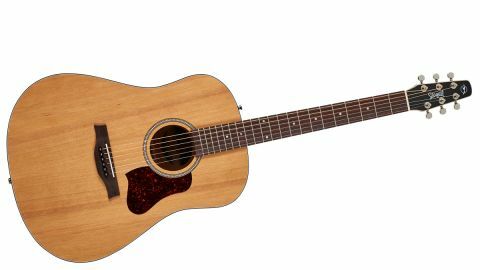 Just like how the Yamaha Pacifica 112 revolutionised the budget electric guitar market, the S6 designers put an emphasis on decent tonewoods, including a solid cedar top, and robust build quality for the acoustic mob. You weren’t wasting your money on fancy finishes or hardware and it wasn’t only guitar players that took notice: the S6 forced other manufacturers to raise their game to the extent that, these days, affordable solid-top acoustics are simply taken for granted. Which brings us to the latest version of the Seagull S6. Confusingly called the S6 Original, this reboot offers a new dark finish in its back, sides and neck, and a 45mm wide top nut, compared to the all-natural aesthetics and slimmer 43mm nut spec’d on the new S6 Cedar Slim, also priced at £439. The S6 Original’s dreadnought-shaped body centres around a solid cedar top, and laminated back and sides made of wild cherry. Yeah, the latter sounds like a lap dancer or something but this Canadian timber has been a spec list regular for Seagull and Godin’s other brands for many years. Despite the slim profile, the S6’s silver leaf maple neck feels stable and robust, and fills the palm nicely. The headstock is snake-hipped too but that ice-lolly shape is designed to ensure a straight path for the strings between the top nut and tuners. This reduces string drag for better tuning stability. The 406mm fingerboard radius and a low action make for an easy ride across the octaves. Tonally, the S6 Original reveals a maturity beyond its years. That’s the cedar top for you. Cedar requires less playing in than spruce before it gives up its goodies, and remains popular with players looking for a warmer-sounding tonewood that responds well to fingerpicking. Don’t think that excludes the strummers however. The 648mm- (25.5-inch) scale length puts plenty of twang in the strings making the S6 Original versatile enough to handle anything. This Seagull won’t dive-bomb you on Brighton pier and try to nick your choc ice but like their pesky beaked and feathered namesakes, the S6 Original doesn’t half project a lot of sound. It's a tough bugger too. This is a guitar you can backpack with, tie to the roof rack of your camper van, or use to repel drunk ne’er-do-wells down at your local open mic night. Thanks to its solid cedar top, the S6 Original version is tonally satisfying straight off the shelf. We also like the 45mm nut width and the wider string spacing it affords. Some players, electric cats in particular, may prefer a thinner 43mm nut, and you can have exactly that with the aforementioned S6 Cedar Original Slim and the Godin EPM Quantum preamp-equipped S6 Cedar Original Slim QIT (£539). Unlike its ancestor, the S6 Original is now jostling for your attention in a very crowded market. The interesting thing is that the basic premise behind Seagull guitars hasn’t changed. You’re still getting great tonewoods and build quality at a price that knocks much of the competition off their perch. That’s why these guitars are still at the top of the mid-range pecking order.